Joseph Thomas Jennings was born on 21 June 1930 at Washington, District of Columbia. He was the son of Francis Joseph Jennings and Catherine Florence Hans. 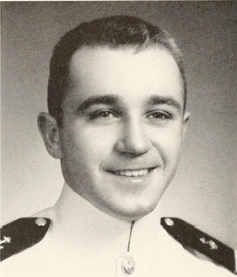 Joseph Thomas Jennings graduated in May 1954 from the United States Naval Academy, Annapolis, Anne Arundel County, Maryland. Joseph Thomas Jennings married Mary Anne Thomas on 5 June 1954 at Saint Teresa of Avila Catholic Church, 1244 V Street SE, Washington, District of Columbia. Joseph Thomas Jennings died on 25 October 2004 at St. Mary's County, Maryland, at age 74. He was buried in November 2004 at St. James Cemetery, Ridge, St. Mary's County, Maryland.